Yes, there's a value case for some people (security, living overseas, etc) …Yes, there's a value case for some people (security, living overseas, etc) but for everyone else: imagine giving £1 each to the next 135 people who ring your doorbell. Then ask yourself if it's worth it for the benefits it brings. This makes no sense dude. Still holding out for a slimmer model like the pro version as these look like a brick taped to the wall. Only downside is, not knowing there was a subscription before I got it, so you have to set that up after the 30 day free trial. did someone mention free 6 month's cloud subscription with this deal? Not with this one. But wait until Monday. 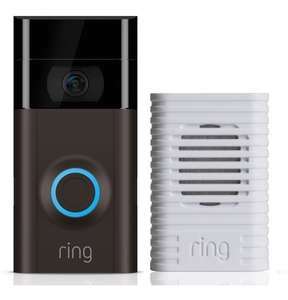 I use this doorbell myself and it's actually really good/handy Only …I use this doorbell myself and it's actually really good/handy Only downside is, not knowing there was a subscription before I got it, so you have to set that up after the 30 day free trial. Can be dependent on broadband connection as to how quick they kick in. Yes, there's a value case for some people (security, living overseas, etc) but for everyone else: imagine giving £1 each to the next 135 people who ring your doorbell. Then ask yourself if it's worth it for the benefits it brings. That's real security concern, lm currently looking at the Elite and Hello, as 1 has Poe and the other recorders 24/7, but there also others factors involved before l make my choice, the new generation that will be released in q2/3. You have the wrong picture showing the one at Costco has the standard chime you’re picture shows the chime pro ! I’ve had this 2 years now. This is excellent FOR ME , but I’ve read reviews that’s it’s not been good for others. - the chime pro has a built in WiFi extender in it (hence those mini aerials) as oppose to the standard chime . Otherwise Both are chimes whose volumes and tones can be adjusted / changed. Saying that, I don’t use my chime pro for its WiFi extender as it causes video lagging (important to mention no time delay with notifications though) , but when I connect my doorbell to the house WiFi directly, there’s no video lag. However funnily, the ring measures interference connection with RSI and the lower this number is, the better the connection is meant to be, but although my chime pro has a lower RSI (meaning lower interference) , like I said above it creates a video lag. - the connection to your router depends on few things, which can make it hit or miss. E.g distance of router to doorbell, thick masonry walls , porches etc all the above affects connevtivity and therefore performance. You could therefore have super fast broadband but due to house structure and thick walls etc, you may find the connection poor and not performing. I’ve read many reviews on this. Saying that, again funnily , It says I got an OK to POOR connectivity rating when connected to my house WiFi directly, but performance is second to none-no issues in anything. - the app is very good, always improving with new features. Responsive so all good there. - customer service is quite good, always available round the clock and recently they replaced my doorbell free of charge eve after 2yrs due to it draining the battery excessively. - you can buy spare batteries so it’s always on whist others recharging. All in all, good product if it works well. 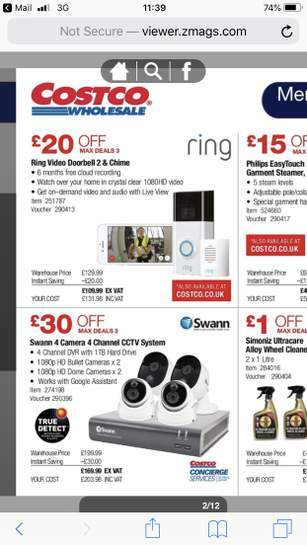 Simply trying to get people to visualise their 'cost per use' of a very expensive doorbell. Been doing a load of reading about the V2 and in particular hardwiring it when there's no existing doorbell wiring in place. All the information seems to point to getting what amounts to a standard 18V AC transformer to plug into the wall but a need to wire in what appears to be a hefty resistor. Just wondering if anyone has done this and how they've gone about it (the idea of a 5m cable with an exposed chunky aluminium cased resistor seems a bit rough and ready). Been doing a load of reading about the V2 and in particular hardwiring it …Been doing a load of reading about the V2 and in particular hardwiring it when there's no existing doorbell wiring in place. All the information seems to point to getting what amounts to a standard 18V AC transformer to plug into the wall but a need to wire in what appears to be a hefty resistor. Just wondering if anyone has done this and how they've gone about it (the idea of a 5m cable with an exposed chunky aluminium cased resistor seems a bit rough and ready). The Ring 2 operates between 8-24V AC so you can either buy one of these. or one of these. A Byron 776 which is a mechanical doorbell chime with a transformer built in. The chime will sound when the button is pressed. No need for any resistors with these options. My Ring V1 has been hardwired into a Byron 776 continually now for nearly 4 years now with no issues. A Ring 2 will have no issues using either of these options too. Isn't there a free cloud option where you can't view your recordings or alerts afterwards? I like the way they advertise it as being able to fool potential burglars that you’re at home. Because burglars don’t watch tv and can’t read the logo on the device. It definitely mentions the 6 months on the PDF email attachment COSTCO sent out today. Simply trying to get people to visualise their 'cost per use' of a very …Simply trying to get people to visualise their 'cost per use' of a very expensive doorbell. FYI it could be 0 to an infinite amount of uses so could be £135 for 0-1 use or super cheap! FYI it could be 0 to an infinite amount of uses so could be £135 for 0-1 …FYI it could be 0 to an infinite amount of uses so could be £135 for 0-1 use or super cheap! I noticed from today the offer is £131.98 which also includes the 6 month subscription. Are these difficult to fit? No. It’s very easy to install. But tbh, most wifi doorbell cameras are easy to install. True. This is one of the downsides to the Ring doorbell. But it is partially down to your wifi connection. Some wifi doorbells don’t like working on 5ghz wifi, so its worth trying to spliting your wifi if you find it slow. Can tell you don’t do business cases for a living. Secondly you are ignoring the very real tangible cost reduction of not having to go to parcel depots, not just fuel but wear and tear on vehicle, reduced risk of not travelling and whatever you value your own time at. Thirdly you are assuming that there is no value derived by people viewing their front door camera when they are out at work. Fourthly you are ignoring the risk reduction of undesirables knowing that their presence has been detected. Average burglary cost is £3400. I have deterred three separate incidents and I live in a semi affluent suburb. What a comprehensive and logical response. Bravo. Hopefully that will be the end of his nonsense. Yes it’s a doorbell but it’s also a motion detection CCTV system for your front door which stores footage to the cloud. It’s funny how folks are happy to pay considerably more for Netflix, Spotify, Apple Music, Sky, Virgin media, Deezer, Amazon Prime Video/Music or any phone contract plus all manor of other toot but at £24 annually or less than 7p a day for the Ring subscription and they’re outraged. Yes it’s a doorbell but it’s also a motion detection CCTV system for your f …Yes it’s a doorbell but it’s also a motion detection CCTV system for your front door which stores footage to the cloud. It’s funny how folks are happy to pay considerably more for Netflix, Spotify, Apple Music, Sky, Virgin media, Deezer, Amazon Prime Video/Music or any phone contract plus all manor of other toot but at £24 annually or less than 7p a day for the Ring subscription and they’re outraged. It's a doorbell(!) you can't seriously be comparing music, film, and mobile phones with a doorbell subscription? !